And hey, here's a special Monday night Human Target; maybe somebody at Fox programming got their "mediocre procedurals with misanthropic anti-heroes" mixed up. (Admittedly, Chance is nowhere near as cynical as House, but he does tend to see people at their absolute worst.) Tonight's episode, thankfully, kept Ilsa and Ames to a minimum, although their presence on the series continues to drag down every scene they appear in. "Kill Bob" instead focused on a guy whose life was in danger. In a stunning twist, his model-hot wife was trying to kill him! Only maybe she's actually really in love with him after all, and she's just trying to fake kill him to save his life from her evil Russian bosses. Or maybe she isn't. No, wait, she definitely is. If I had the time and the patience and, really, any serious reason to do so, I suspect it would be possible to chart every scene in tonight's episode back to the scene in some other show or movie that it rips off. Which in and of itself is not really a crime. The language of modern entertainment uses our knowledge of cliches and tropes as though they were words just waiting to be put into new sentences; it's not so much that Bob dodges his motorcycle-riding assassin in the cold open by ducking down for a cell phone call, it's the little details that play off our expectations and keep us engaged. That's how a show demonstrates its respect for its audience, by being upfront with its source material and then expecting us to appreciate the twists. The twist here is that Bob is dancing to "Bust A Move" in his car before the attack, to let us know he is a complete and total dork. So, yeah, I hope you're all feeling the love as much as I am right now. 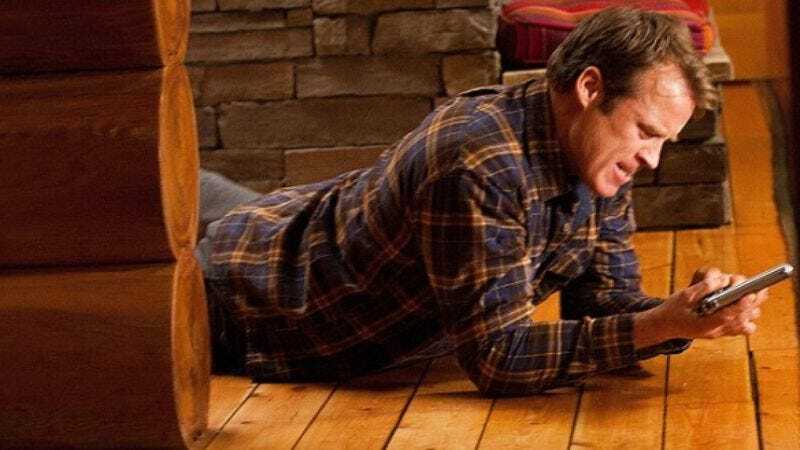 "Bob" was sitcom plotting through and through, from the comically villainous Russians, to Winston's increasingly odd objections to romance, to Bob's utter cluelessness, cluelessness, I might add, which suggests an unsettling amount of brain damage. Seriously, I get that he's nerdy and (supposedly) sweet, and that's why his wife, Angie-nee-Natalia decides to forgo her husband killing ways, but this is pathetic. He shows some spark at the end by corrupting the data files he hands to the bad guys with a virus, but it's too little, too late. Bob's stupidity was far from the greatest of the episode's crimes. At least Dumb Bob was consistent. There are a couple of plotholes here that boggle the mind. Like, how the hell does Bob end up at Chance Industries in the first place? I realize Ilsa's presence in the company has given them a somewhat higher profile, but there's no connection between the opening attack, and Bob's terrified interview with Chance and Winston at the office. If this guy is supposed to be so utterly naive and baffled by the world of espionage and guns being shot, how would he know exactly where to turn when his life was endangered? Why wouldn't he got to the cops first? There are ways to explain this (the company he works for could've hired Chance, for one), but from all we can tell, he just wanders into the building a few hours after nearly getting killed. I don't mind shortcutting exposition to maintain narrative momentum, but it would be nice if we could be bothered to construct stories, as opposed to just throwing out some scenes and expecting they'll end up in the correct order. Then there's ""Bob's" convenient forgetting of Natalia's murderous past. She's had husbands before Bob, and at least one of them wound up dead, which, given her working relationship with her Russian bosses, means she almost certainly killed him. But who cares, right, because she's in love with Bob now, and that makes everything OK. The big theme of "Kill" was, I guess, love and stuff; we even got a bizarre, pointless, and thuddingly unfunny subplot in which Ames gets married to a guy in Vegas and then annuls the wedding by the episode's end because she's wacky, and stuff. I almost wish they'd push this crap even further. Have Ames running around in a polar bear costume for all of one episode. Make Ilsa reveal she's actually from Mars and Chance has to hitch a ride on Guerrero's rocket ship to save her from the vengeful Barsoomians. If we're going to throw logic to the wind, at least go batshit crazy with it. 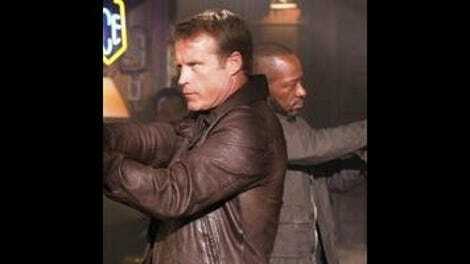 As is, Human Target is part of the Human Centipede of action dramas, and it's not the top part, if you follow. If you don't follow me, feel free to Google the movie, but I warn you, you won't get that part of your brain back. If a C seems high after that review, well, most of "Kill" was still sort of watchable. Mediocrity's like that. (Also, the fight between Chance and Natalia was pretty cool.) If Ilsa and Ames had played more of a part, I suspect the grade would've been lower. Apart from Guerrero, who remains the only consistently entertaining character on the show, the one intentionally funny bit I actually laughed at: "Don't kill me." Wow, so do not care about this new stunning revelation about Ilsa's husband's zzzzzzzzz.